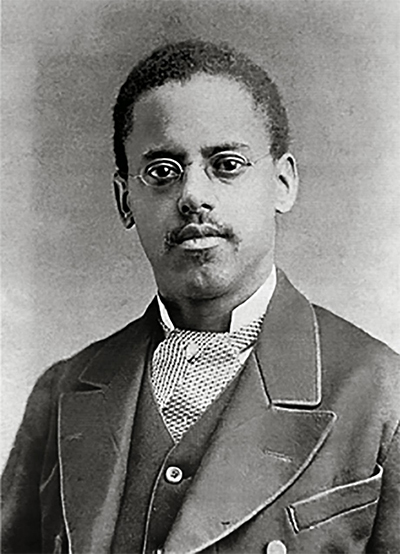 Lewis Howard Latimer was born in Chelsea, Massachusetts, on September 4, 1848, six years after his parents, George and Rebecca Latimer, had run away from slavery in Virginia. They were determined to be free and that their children be born on free soil. Because of his light complexion, George was able to pose as a plantation owner with the darker-skinned Rebecca as his slave. Shortly after arriving in Boston, Massachusetts, he was recognized as a fugitive and jailed while his wife was taken to a safe hiding place. The arrest was protested vigorously by the community. Frederick Douglass, a former slave who had escaped to Massachusetts several years earlier, and abolitionist William Lloyd Garrison spoke forcefully against the arrest. There was a trial, and the attempts to recapture George and return him to Virginia caused considerable agitation in Boston. When the trial judge ruled that Latimer still belonged to his Virginia owner, an African-American minister paid $400 for his release. Although free, George was still extremely poor, working as a barber, paper-hanger and in other odd jobs to support his wife, three sons, and one daughter. Lewis Latimer, the youngest child, attended grammar school and was an excellent student who loved to read and draw. Most of his time, though, was spent working with his father, which was typical of children in the 19th century. In 1857, the Supreme Court ruled that a slave named Dred Scott could not be considered a free man although he had lived in a free state. George Latimer disappeared shortly after the decision became known. Because he had no official papers to prove he was a free man, he possibly feared for his safety and that of his family. With his father gone and his mother struggling to keep the family together, Lewis falsified his age and joined the U.S. Navy in 1864 when he was sixteen years old. When the Civil War ended he was honorably discharged and returned to Boston to seek employment. In 1868 he secured a job as an office boy in the Crosby and Gould patent law firm, a company that specialized in helping inventors protect their patents. By closely observing draftsmen at work and reading books on the subject, Latimer taught himself mechanical drawing. He learned to skillfully use the vital tools of the trade, such as T squares, triangles, compasses, and rulers, and mastered the art of drawing to scale. Since all of the drawings were done by hand and in ink, it was very important that a draftsman not make mistakes. Latimer's drawings in this medium are as beautiful as works of art. After several months of studying on his own, he requested and was given an opportunity by the firm to show what he could do. Upon discovering that Latimer was indeed a skilled draftsman, he was promoted from office boy, earning a salary of $3.00 per week, to draftsman at $20.00. In the period immediately following the Civil War, important scientific advances occurred in America. There was an explosion of inventions and new uses of technology, and inventors were securing thousands of patents in growing industries. While working at the Boston firm, Latimer met Alexander Graham Bell who hired him to draw the plans for a new invention, the telephone. Bell was in a race to have his invention patented before anyone else registered a similar device. By working with him late at night, Latimer was able to provide Bell with the blueprints and expertise in submitting applications that allowed him to file his telephone patent on February 14, 1876, just a few hours earlier than that of a rival inventor. They had won the race! In 1880 Latimer began work as a mechanical draftsman for Hiram Maxim, an inventor and founder of the U.S. Electric Lighting Company in Brooklyn, N.Y. In his new job, Latimer was given the opportunity to become familiar with the field of electric incandescent lighting, an area in which there was fierce competition to secure patents. In addition to his work with light bulbs and lamps, he went to U.S. cities and abroad supervising installation and production of Maxim equipment. In 1884 he was invited to work for Maxim's arch rival, Thomas Alva Edison, in New York. 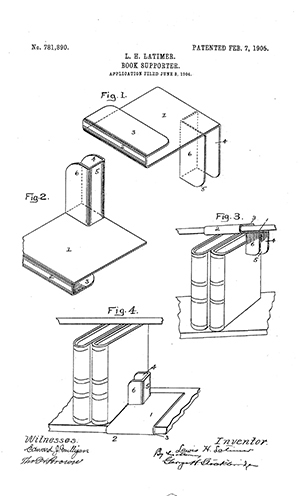 An expert electrical engineer, Latimer's work for Edison was critical for the following reasons: his thorough knowledge of electric lighting and power guided Edison through the process of filing patent forms properly at the U.S. Patent Office, protecting the company from infringements of his inventions; Latimer was also in charge of the company library, collecting information from around the world, translating data in French and German to protect the company from European challenges. He became Edison's patent investigator and expert witness in cases against persons trying to benefit from Edison's inventions without legal permission. Edison encouraged Latimer to write the book, Incandescent Electric Lighting: A Practical Description of the Edison System. Published in 1890, it was extremely popular as it explained how an incandescent lamp produces light in an easy-to-understand manner. On February 11, 1918, Latimer became one of the 28 charter members of the Edison Pioneers, the only African-American in this prestigious, highly selective group. After leaving Edison's employ, Latimer worked for a patent consultant firm until 1922 when failing eyesight caused an end to his career. His health began to fail following the death of his beloved wife Mary Wilson Latimer in 1924. To cheer and encourage him to carry on, his children, two daughters, had a book of his poems printed in 1925 in honor of his 77th birthday. The poems are beautifully sensitive, and complement Latimer's designation as a "Renaissance Man" who painted, played the flute, wrote poetry and plays. Active in the Unitarian Church, Latimer found time to teach mechanical engineering, drawing and English to new immigrants at the Henry Street Settlement House. He had remained extremely patriotic, participating as an officer of the famed Civil War Veterans' organization, the Grand Army of the Republic (GAR). In addition, he supported the civil rights activities of his era. On December 11, 1928, Lewis Howard Latimer died, leaving a remarkable legacy. His name will be forever associated with two of the most revolutionary inventions of all time: the incandescent electric light bulb and the telephone. In 1995, the Queens Borough Public Library in New York mounted an exhibit on Lewis Latimer. The illustrated catalog from that exhibit, containing several scholarly essays, is now available online on the Thomas A. Edison Papers Web site. Permission granted by Dr. Winifred Norman for reprinting Lewis Howard Latimer's poems "Friends" and "Ebon Venus."